Crown Bingo has lots of fantastic offers this month including the chance to win a £500 in holiday vouchers to whisk you and your family away. Every time you deposit £10 at Crown Bingo during July you will qualify for this promotion so the more you deposit the more chance you have of winning. Take part in CM Quest where teams of ten players headed by a CM compete in a fun trivia quiz where an incorrect answer lands the CM in question, a forfeit! There’s £200 in bingo bonuses and a virtual trophy which will read the winning team’s name and be featured on the wall of fame. The fab CM Quest night will play next Monday 5th July in Room2 from 7pm. Also this month, Crown Bingo players can play bingo for a family movie ticket to take you and your brood out to the flicks. This promotion will play between Thursday 8th to Sunday 11th July in Room 2 and UK75 from 9pm. 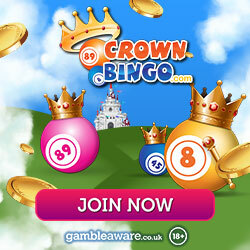 Crown Bingo has also been busy hiding away buckets and spades in their ‘Find the Bucket and Spade’ promo. These items have been hidden in 4 different locations somewhere on site. If you successfully manage to find them you could win a £20 leisure voucher. Simply email the support team with your answer and three players will be selected at random to win the voucher prize. Get hunting next week between Thursday 8th and Sunday 11th July. Every Wednesday night at 9pm there will be special Pre-Buy bingo games where you can win some fantastic prizes ranging from Alton Towers Day Tickets to a Pamper Day at Bannatyne Spa. Tickets are available to buy five days before each game at 50p per ticket. On Friday 23rd July Crown Bingo will introduce new Session Bingo where you will be able to purchase tickets for a half hour period of bingo games for £5. For this price you can play half an hour of bingo in Room 2 from 7pm and there’s a total prize pot of £100 to be won. There’s lots on offer this month at Crown Bingo and they will also debut their all new TV adverts from the 1st of July so keep an eye out for those or visit the site for more info.